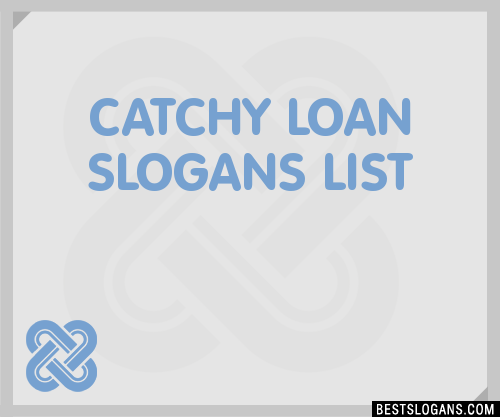 Great loan slogan ideas inc list of the top sayings, phrases, taglines & names with picture examples. Here we've provide a compiled a list of the best loan slogan ideas, taglines, business mottos and sayings we could find. The results compiled are acquired by taking your search "loan" and breaking it down to search through our database for relevant content. 1 You're Not Alone, If You Need a Loan. 2 Need a loan? You're not alone. 3 When money is the problem - we're the solution. 4 Down the road to financial freedom. 5 Turning money problems into solutions. 6 Not your traditional lender. We're better. 12 Solid Advice for Tough Times. 13 We Always Lend A Helping Hand. 14 Your Friend in Need. 15 Bad credit in good hands. 18 We're a Small Company With Big Ideas for YOU! 19 If we can help, we will. 20 When other doors close - ours is always open.